Okay! Musume Time: Okay! Musume Time's First Contest: Results! Anyway, this is it! The contest results! The post where I reveal the winner of a CD of their choosing, Regular Edition only, as a part of my thank you to the readers who had all helped me to reach that amazing 50,000 views that I never thought I would reach! Seriously, everyone, thank you! The judging itself was extremely hard, even with my sisters help, but in the end I (finally) decided on a winner, though the topic they did (out of the three given) which hepled them to win actually surprised me, because I didn't expect anyone to win under this specific topic. I will get into more detail in a little bit, so that you understand me a little more! Anywhoo, I had better post the winner before I dither away into nothing and leave you all hanging, because yeah... you need to know, guys! So I'm sorry for keeping you hanging! The winner of my 50,000 views contest is Phob, who entered a post on her Top 5 People and Top 5 songs, reviewing each of the songs she chose and giving her reasons for why she liked them. So, Why? I really liked the review, and this is coming from someone who pays zero attention to four out of five of these singers. I am not a fan of any of them, to be honest, but this review was a great read. I was surprised by how much I liked it, actually! Even though I like girl groups, I was pretty engrossed in how much the writer liked these five singers, and I liked her reasons why too. She really captured the essence of the review and helped me to understand more about the singers and the songs she chose, and I became interested in them all. Phob has a certain way of writing which is really interesting, and really caught my attention. She made me want to know more about these singers, and I wanted to listen to all the songs. She left a strong impression with her writing, which is why she is the winner of this contest. Now, Why am I surprised a review won? Because I only received three reviews as entries, and honestly, I thought that a banner would win - but I was extremely impressed with how Phob expressed herself, and whilst there were other entries which were amazing and really caught my attention, this entry left the strongest impression on me. The decision for the runner-up prize was quite hard, because I had two banners that I really liked and wanted to win, but in the end my sister helped me to decide on this one, meaning that Ran-chan is the runner-up for this contest. The banner she created is extremely colourful, with shadows of the Morning Musume members in the background, as well as the girls themselves in the front. The most interesting part of the banner is definitely the writing though, it looks like it was hand-drawn, which must have taken some time itself. Ran-chan really did a great job on this banner, and the time and effort she spent on it really show., which is why I think that she deserves the runner-up prize. I will send an e-mail to both winners, and will send their prizes as soon as I can. Keep an eye on your e-mail inbox's girls! I received two other reviews, the first by Meika, and the other by Magiko. Meika reviewed an Indies Idol unit called Candy Kiss, with a great amount of research and detail put into her review. I enjoyed her description of the group and song, and the time and effort she put into the review. It was a wonderful read, and introduced me to a new group! I always appreciate Indies Idol unit reviews, because it opens a fan to new and fresh girls we wouldn't know about because they really aren't that well known in Japan or overseas! The second review by Magiko was on Morning Musume's recent single, One Two Three, and was a detailed look at not just the single, but also the covers, members and costumes. I enjoyed her review and how she was honest with her views on the single and the members themselves. For her first review, Magiko is quite the talented blogger, and I look forward to future reviews from her! I will next reveal the entries for the drawings I received! There were only three entries, but I was really thankful that the girls (or boys?) put their time and effort into each of their drawings! The first entry was from Momo, who drew this picture from the inspiration of Sayumi mothering the 10th generation members, with Haruka being the baby (who looks a tad grumpy? 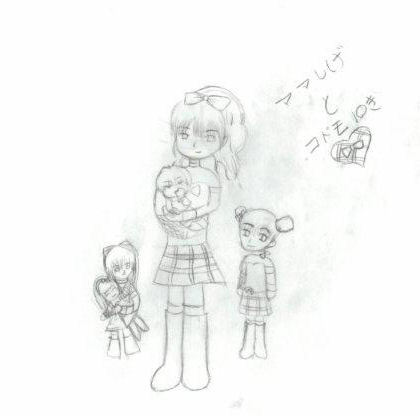 xD), Haruna being the older sister, and Ayumi holding a toddler who is Masaki. This picture is seriously cute, and I love the motherly theme of it! It really does seem like Sayumi has become a mother to the new members, eh...? 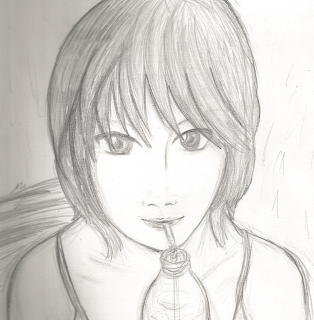 This was an entry from Phob, who drew a picture of Takahashi Ai. The drawing is pretty, and I like the detail that has gone into Ai's eyes and her hair, too. The style is quite anime-ish, and I really like that. Whilst I don't know if there is a background story to the picture at all, I can really see the effort that Phob put into the entry. The last entry was by Meika, and it is a drawing of the darling Eripon! I was surprised to receive another drawing entry, actually, but I was happy to see Eripon in there, smiling away! The drawing is so cute, and I like the detail that went into her shirt. You can really see that it is Eripon, which my sister thought was good, and whilst this isn't the same anime style drawing like the other two, I think that this is a wonderful little drawing that must have taken some time to finish up! And finally the banners. This was obviously the topic that most people chose because it is one which people do admittedly find easier to make. I had seven banner entries for this contest, and this was the toughest category to vote on. Even my sister had a hard time judging! Magiko-chan entered with this banner before her review, and I really fell for this banner. I loved the simple concept of it all I'm a sucker for simplicity, I admit and liked how she simply chose Haruna's eyes and nothing else. The font is also really eye-catching, as well as the overall texture of the banner. Magiko gave me something quite simple, but extremely pretty! Momo entered with this banner - my beloved Koharu in all her glory! I absolutely adore Koharu, and I know that my readers know that, so to see a banner filled with her beauty was a wonderful surprise! I really like the dark and edgy style of the entire banner that Momo created, with writing that captured the look and feel of the background as well. Now, allow me to bow down to Koharu!!! This banner is from Phob, who created it from my love for Lord Gaki-sama! I like how the banner itself looks like a news headline with the way the writing is styled and how the photo's are coloured differently, though my little peeve of this banner was that the same picture was used throughout, though the way the images were coloured or set was different each time, with the centre picture keeping its size. Next up is Nia, who actually sent in more pictures than she should have, though my sister chose this one out of the ones Nia created. Nia has a certain love for the Creeper, Mayu Watanabe, and I like that she used an image from Otona Jelly Beans, adding sparkles and all that good stuff to it to give it more PAZAM! The picture is simple but really cute, and I like the added sparkles! Simplicity at its best! The final banner actually comes as a little set! 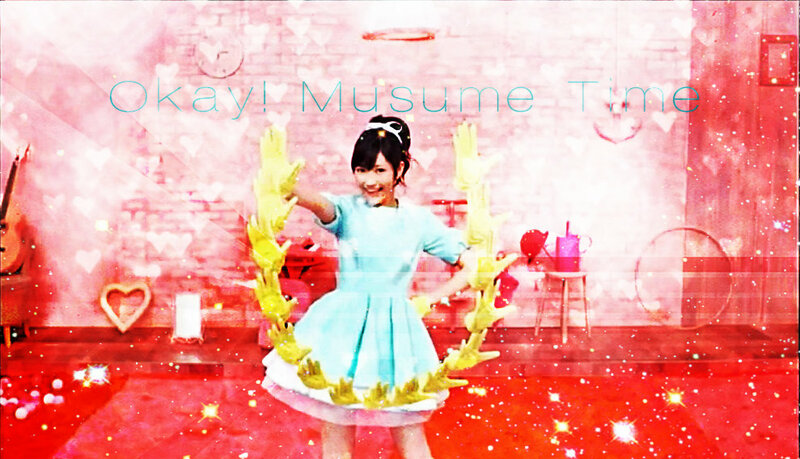 A banner and a background, and this is from Kioku-chan, who used the silhouettes of the Morning Musume members from One Two Three as well as another image of the girls to create her banner! I actually didn't see the silhouettes, but after seeing it fully, I came to really appreciate the effort and thought that was put into this banner. It looks simple, but there must have been a lot of work put into it! This banner was a serious contender for the winner, because the overall look and finish is really unique and different to the other banners. Here is the background that comes with it, and honestly, this was what I was waiting for with the entries - for a banner (or in this case, a bg!) to include my little tag line, Winking Wota!, though no one really did put the tag line in until Kioku put it in, so thank you Kioku-chan for including it! This really did make me so happy! And with that, all the entries have been shown! To everyone who entered, thank you so much! I really appreciate everything you guys gave me, and I am really sorry that I can't give everyone a prize! Hopefully I will hold another contest at some point, and hopefully you will all enter again! To those who didn't win, I'm sorry! Please don't feel bad, or mad... or sad, because I hope there will be other oppurtunities for you all to enter another contest! Oh my gosh! Everyone's entries were so good! I can see why you had such a hard time. x'D I especially love Meika's drawing and banner. Ran-chan's banner is indeed very colorful and sets the mood perfectly for visitors of your blog. Congratulations to the winners and congratulations to Chiima for a successful first contest! Thank you Kioku! I was so happy with the entries, but yeah, too hard to choose! I really liked yours because of the effort and the unique idea you used! Everyone's entries look so good~! :O Especially Phob's banner! The style fits my taste SO much! :DDD And thanks Kioku! ^.^ But man, Chiima, why'd you have to tease me by saying you wish you could give me a prize!? WHY!?! XDD Just kidding! I'm sorry! DX next time, please enter >3< I look forward to more ideas from your creative mind!!! !